Fly-half Gareth Steenson inspired Exeter Chiefs to a stunning win at Premiership leaders Harlequins. Steenson kicked five penalties and a conversion, and also created the opportunity for Damian Welch's try. Ugo Monye's score had Quins in front early on but Exeter kept in touch at the Twickenham Stoop and sealed a famous victory with an opportunist effort from full-back Luke Arscott. The result means Saracens will go top with a win over London Welsh on Sunday. Exeter, meanwhile, completed the double over the reigning Premiership champions and still have genuine hopes of qualifying for next season's Heineken Cup. 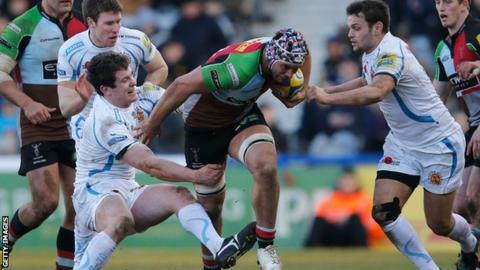 Harlequins were boosted by the return of influential fly-half Nick Evans and he was instrumental in the home side's first try after five minutes. They switched the ball quickly across the field following a line-out and Evans combined with centre Jordan Turner-Hall to send Monye racing over the line from 20 metres out. Steenson replied shortly afterwards with three penalties in quick succession for the Chiefs, before Evans responded with a kick of his own to give Quins a one-point lead at the interval. Harlequins replacement Ben Botica and Steenson swapped two kicks apiece early in the second period, as both sides tried to wrestle control of the game. It took a moment of magic from Steenson to prise open the home defence, dancing through two tackles to break the line and when he was held up, the ball broke to lock forward Welch who crashed over from close range. And when Harlequins made a mess of a 22-metre drop-out, full-back Arscott ran in almost unopposed to secure a first Premiership away win for the Chiefs since November. "That's the second time we've been outmuscled by Exeter. There was never any massive intensity or energy in our play as they held on to the ball and won all the collisions. "I'm frustrated as every time we edged in front we conceded a penalty, but all credit to Exeter as they kept coming and coming and ramped it up at the end. "We were tired out with all the tackling we had to do as a result of coughing up possession. "It was not a train crash today. It's a long haul but we will have to rectify this performance as we face two tough games now, but it's all about finishing in the top four and that is in our own hands. "When we lost at Exeter in October we went on a winning run of 10 games so we learn our lessons well." "We showed great intensity and a great work ethic especially in our defence as they are the top try scorers in the league. Today our performance was spurred by ambition, not fear, as we are safe from relegation. "We saw today as the beginning of a cup run. We've taken nine points from the last two games and you soon move up the table. "It was good to play on a firm pitch which suits us but I'm still frustrated by our loss at Sale as we should have finished that game off." Harlequins: Lindsay-Hague; Williams, Hopper, Turner-Hall, Monye; Evans, Dickson; Lambert, Gray, Johnston; Easter, Robson; Fa'asavalu, Wallace, Guest. Replacements: Botica for Lindsay-Hague (19), Lowe for Hopper (59), Burns for Dickson (75), Buchanan for Gray (61), Trayfoot for Guest (70). Not Used: Marfo, Collier, Matthews. Exeter Chiefs: Arscott; Nowell, Naqelevuki, Dollman, Jess; Steenson, Thomas; Rimmer, Yeandle, Brown; Hayes, Welch; White, Scaysbrook, Baxter. Replacements: Whitten for Naqelevuki (60), Chudley for Thomas (75), Moon for Yeandle (75), Mitchell for Brown (60), Ewers for White (59). Not Used: Clark, Hanks, Mieres.